A culture without Mythology is not really a Civilization. We all have read the truncated forms of Indian Mythical narratives that have described various stories of Gods and Asuras. Still, there is a void in our bank of knowledge, for we haven’t found a book that narrates all the important instances in a simpler and more appealing form. 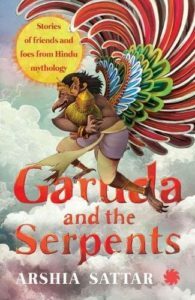 ‘Garuda and the Serpents’ is an anthology of short stories that open up the chest containing the abundance of Indian Heritage. Divided into 18 short chapters, the book helps the readers recall the prominent events of the past like the churning of the ocean to obtain Amrit Ras, Sugriva’s fight against Vali, Indra’s mistake of injuring Hanuman, Rahu’s vengeance against the sun, the role of Jambavan and much more! It is so interesting to know about what made River Ganga come down to the Earth, what caused Lord Shiva’s throat to turn blue and how the miraculous cow, Kamdhenu, fought against the mighty army of King Vishwamitra. Kudos to Ishan Trivedi for beautifully illustrating and recreating the scenes from the past and splashing various colours on the pages of this book. It not only makes the story interesting but is also one of the major reasons to buy the book. The title of the book has been taken from the title of one of the chapters and that doesn’t quite make sense. A more generalized title would have done justice with the theme of the book. Overall, this marvellous book has top-notch print quality and is worth every penny spent!